Felicity Defined: Part II: Elephants and Birds and Babies - Oh My! Part II: Elephants and Birds and Babies - Oh My! You may recall an earlier post featuring baby shower invitations and nursery art that I designed for a friend ... Well, I had the pleasure of designing the baby showers invitations for that friend Dodie's second baby shower as well and to support her mother in throwing an adorable party by planning games and some of the decor. Dodie is having twins so the baby shower was appropriately themed as "Celebrating 2 Babies on June 2nd at 2pm". We wanted to incorporate this tag line into an invitation that also reflects the twins' nursery decor - which is where the navy, blue and white, chevron pattern and elephants and birds came from. As opposed to the previous invitation that I designed, based on generally the same guidelines, this invitation has a more contemporary feel, whereas the first baby shower invitation had a more traditional feel. I used text as design in this invitation, emphasizing the 2-2-2 to represent the twins and reinforced the twins concept by including twin elephants and twin birds. I used yellow, again, as a pop of color against the navy, gray and white color scheme. The reverse side of this invitation detailed the date, time, location, etc. of the shower over a gray box laid over the navy and white chevron-patterned background. I can't say I really prefer one of the elephant invitations over the other, but I loved the challenge of designing two invitations for two different showers using pretty much the same guidelines all while making them unique. How did I do? I didn't want to produce a product for one client that had the exact same flavor as a product that I had created for another client. While elements from the two invitations are shared, I approached the design of each with the individual shower themes in mind and was able to create two successful designs to celebrate this wonderful occasion! This baby shower was adorable. Dodie's mother did a fantastic job on the food, decor, favors, etc. Lemonade and tea were served in mason jars with ribbon tied around them; single flowers in bright yellow sand buckets adorned each table; and a stunning elephant cake was the centerpiece of the kitchen. 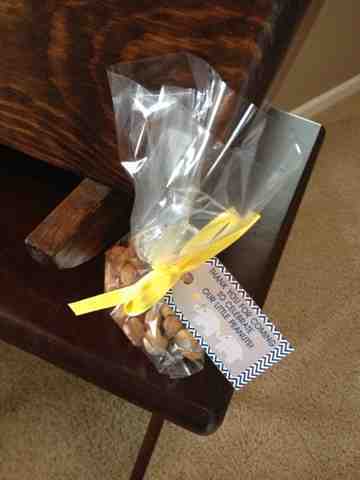 Check out the favors - I was asked to create these cute, little tags that said "Thank You for Celebrating our Little Peanuts" to go along with the bag of peanuts handed out as favors! What a great idea for favors to go along with the elephant theme! 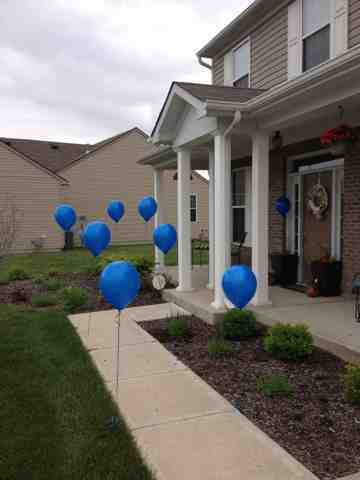 We also created this balloon entry leading guests to the front door, and it turned out super cool! We attached helium balloons to nails and pressed the nails into the ground. We had a bit of an issue with the wind though, the balloons were blowing all over the place, practically attacking guests as they walked up to the door. And we lost a few to the sky as the shower progressed! Overall, it was a cute way to mark the house at which the shower was being held for those driving by. Of course, we have to attribute this idea to Pinterest! My friend Tiffany and I were put on game duty. I think we came up with a nice mix of games that the guests really seemed to enjoy! Game #1 was titled "Things 'N Pairs". Guests were given 3 minutes to write down as many pairs, or things that come in 2s, that they could ... notice how this goes along with the twins theme! The guests came up with some really good answers ... we gave them a few hints to help get the ball rolling too! Examples of things in pairs are shoes, socks, earrings, twins, drumsticks, hands, eyes, gloves, Twix, dice, cuff links, lungs, wings, crutches, speakers, windshield wipers, headlights, skates, knitting needles. The winning guest came up with 24 pairs. Game #2 was titled "TV Children". 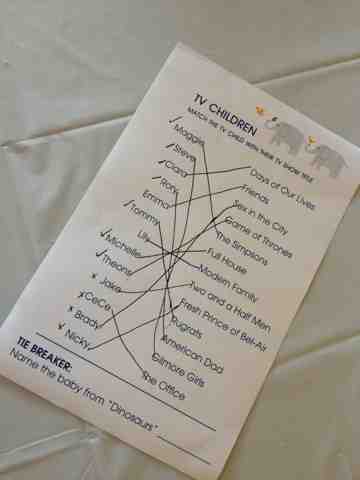 Each guest was asked to match a list of TV show titles with the name of a child featured in that show. The child's name is the character's name, not the actor's real name. We chose TV shows, both current and past, in a number of genres. We also included a tie breaker question in case multiple guests got all of the answers correct. This game was fun and proved to bit a bit challenging. There was only one person who got all of the matches correct! Game #3 was titled "Baby Wishes". This was more of an activity, not a game since there was no winner. Each guest was given a 8.5X5.5" card with pre-printed copy and blanks. The guest filled in their guess as to when they thought the babies would be born, the weight and length of each baby and wrote wishes for the babies and advice to the parents. Each card was collected and bound with jump rings, along with a title card, and given to the mother. The book is intended as a keepsake for the parents, something for the baby book. It is both amusing and personal and a great gift to the new parents from those who love them! This baby shower was classy and fun! I am honored to have been a part of yet another celebration for my friend and her little ones! Don't forget to subscribe to my blog if you like what you read - simply submit your email address in the field above to begin receiving my blog posts via email.